We're having the bathroom remodeled and I have a bunch of tile scraps, mostly rectangular, a variety of widths and lengths, almost all white. I was thinking it might be kind of cool to write out a little story on the tiles and piece them together into a readable mosaic for... I don't know.... a table top.... or garden art.... or something. I thought it would be even cooler to write it out in a foreign language so that it really more of something to look at than to read. Does anyone know a cool little (200 or so words) story, in a foreign language, that I could use? (I'd need a translation too.) Maybe a cool, longish quote? What should I write on the tiles with? How should I seal them so that the grouting process doesn't erase everything? If you're the type of person who sees this kind of stuff as art supplies and not trash, what would you do with your tile scraps? I was thinking of doing the same thing this summer. I have a lot of broken tiles and some old tea cups and plates. I want to build a surround for the BBQ with some counter space and maybe a cabinet on the new deck I'm planning to build as well. I'm not sure it would work, but I was hoping to plant some cacti or mossy type plants in the imbedded cups, kinda like a living wall. As for your idea, which is really cool, perhaps a song or a poem, like 'La vie en Rose' by Edith Piaf. Ohhhh. Your project sounds cool. I want to see photos when you're finished! I'm thinking of either doing a top for my patio table. I have an awful, slapped together patio table that could use some juicing up. Mr. B is already all "oh.... please..... just go buy some art supplies....."
Dont let me put you off but it seems bit 70's boomer. The only time i've seen this done well it was a huge mural on a wall. Seen from a distance it looked good but closer up not so much. I think the pieces of a mural have to be quite small in order to not look...clunky. I dont have any better ideas tho. I see the bits as art supplies, but the last thing I'd do is tell you what to do. Please boomer, listen to yourself. 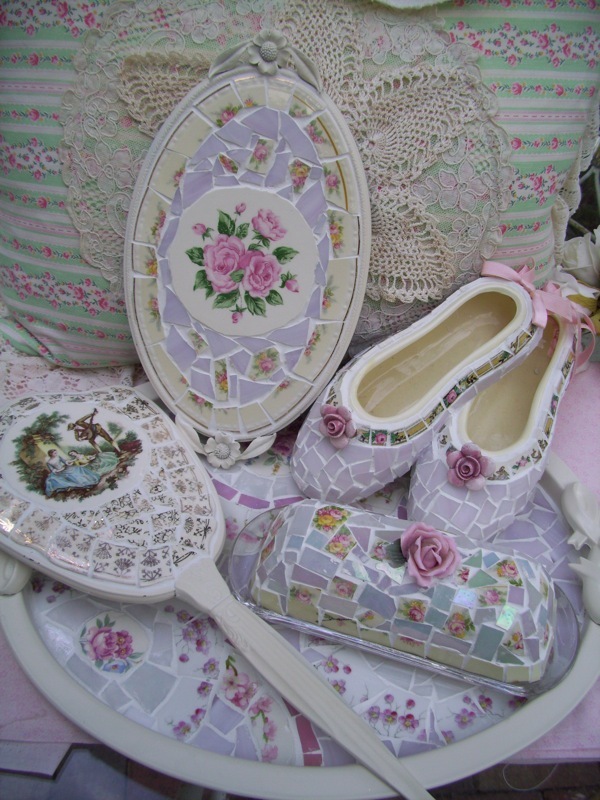 Take a look at this blog for some other ideas for your mosaic project. She makes hers from broken pieces of china that she collects from others. This is an interesting 3-part video on how to decoupage on tile. You could probably adapt some of the technique to your project with the written quotation. A friend owned a cool house designed by a famous architect and she set out to play with it. She made a hopscotch diagram on the entry walk. She did mosaic on the entry steps, and other mosaics. She had an iconic door grab. And much else. It was all her own play, including the rolling shade in the kitchen that was (oh, I'll be quiet). She and I had different interests but we both agreed with play. I probably have slides, but no way to make slides into online photos. Of course, if I ever post them, I'd ask her first. She's got a great design brain, while not essentially mussing up the original design. Osso, I agree with what you say about play. I can't find a reason not to have fun with a house. So does the painting and reassembly idea. 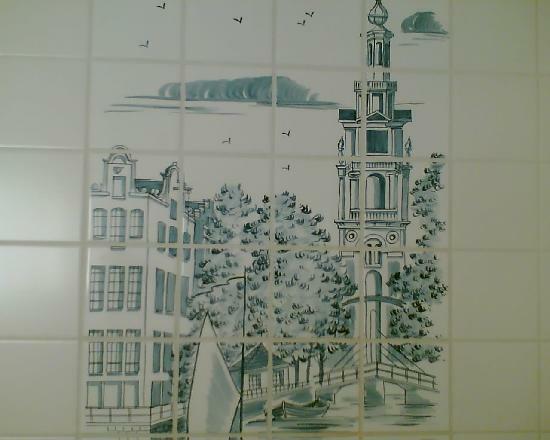 My problem is that my tiles are all in a variety of sizes so they wouldn't fit together in such a tidy way. A lot of artists use words.. I'm thinking of John Baldessari and some others..
» Tile scraps. Now what?